Lower the total cost while increasing lifetime performance of new PV power plants. 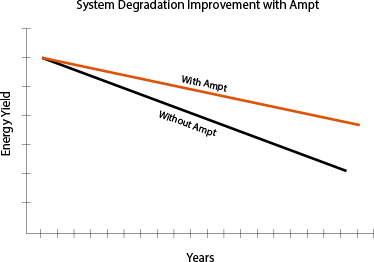 Ampt optimized systems are distinguished from other solutions by uniquely delivering a true spend-less-get-more value proposition. 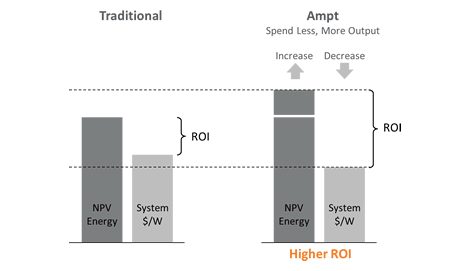 Ampt optimizers save on electrical BOS, inverter, and other costs to lower total PV system cost on day one. Ampt optimizers recover energy from system degradation and mitigate mismatch losses to increase lifetime energy. 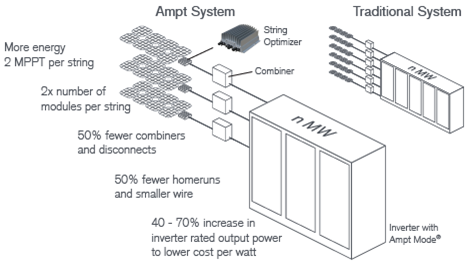 Ampt’s patented technology allows for more modules per string to eliminate electrical BOS components and labor. Inverter’s with Ampt Mode® have a higher power density to lower the cost per watt. Systems with Ampt lower the total system cost on day one and deliver more energy to increase lifetime revenues. Ampt optimizers unlock value in systems with maximum voltages ranging from 600 to 1500 volts. 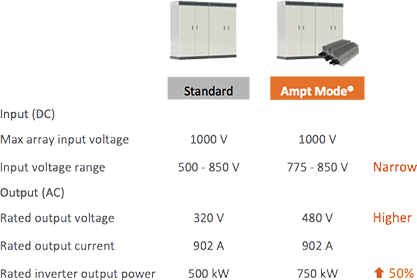 Ampt distributes maximum power point tracking (MPPT) throughout the array to generate more energy across the lifetime of the PV plant. Ampt optimizers eliminate mismatch between strings and recover degradation losses. Ampt optimizers put multiple MPPTs per string compared to central inverters that have only one MPPT for the full array. That is a ~125x resolution advantage with Ampt. Ampt optimizers mitigate electrical mismatch losses that are built into the system or caused by environmental and other sources. The optimizers also recover mismatch losses caused by system degradation. Ampt’s performance advantage increases with time. Ampt’s patented String Stretch ® technology doubles the number of modules per string. 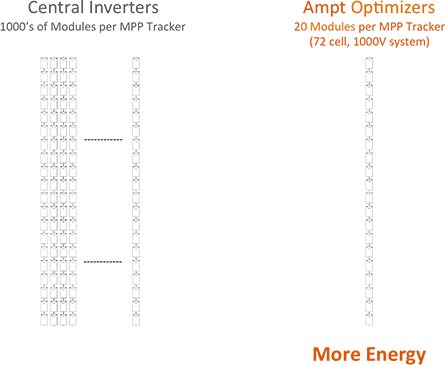 Doubling the power to the combiner without doubling the current eliminates half of the electrical balance of system components to lower the system cost per watt. 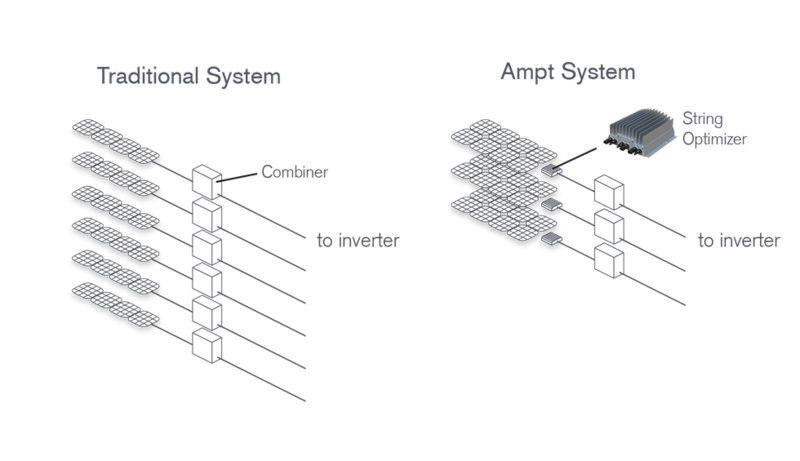 Ampt allows inverters to achieve up to a 70% increase in inverter rated output power. More power from the same inverter lowers the inverter cost per watt.Inverters with Ampt Mode are available in multiple system voltages. 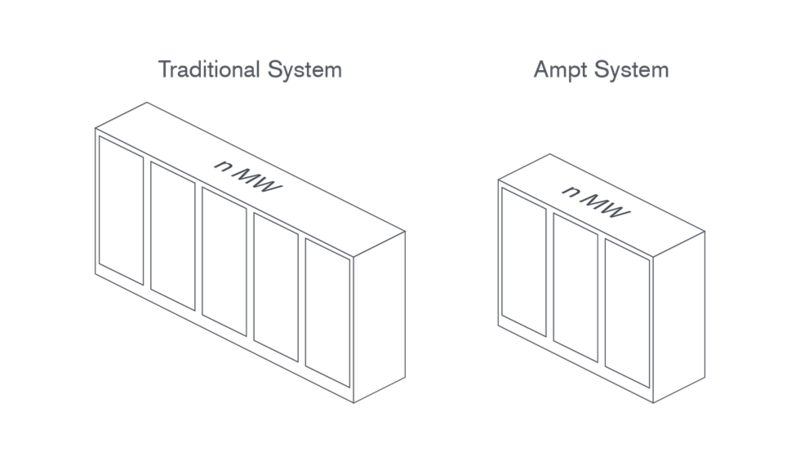 Inverters with Ampt Mode® are configured by the manufacturer to operate in a narrow input voltage range that is closer to the maximum system voltage. This enables a higher output voltage at the same current to increase the rated output power. Inverters with Ampt Mode are available in multiple system voltages. Find out how to optimize your PV systems with Ampt.